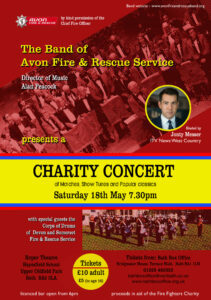 Welcome to the web site of the Band of Avon Fire and Rescue Service, a concert wind band based in Bath. Our Director of Music is Alan Peacock. We perform a very broad spectrum of music styles and genre, and are available throughout the year to perform concerts or provide music at engagements and events. Our primary location is Bristol, Bath and surrounding areas, but we have played as far away as Aix-en-Provence. Scroll down the page for more information, or use the menu bar at the top.